It's believed by some that too much fitness destroys muscle. How can one know that line? Some arguments point to long-distance runners/marathon runners as an example, which are not known to be the most muscular people, but are usually developed well and are quite lean. I ask because I'm trying to be both very fit and athletic, but want to keep building muscle at the same time. People have told me crazy things like claims that I should avoid cardio altogether because cardio supposedly drains or "saps" muscle away directly. I'm not talking about excessive cardio -- these claims point to any cardio and claim that it "burns muscle" even if done very mildly. For example, I saw a thread (BB.com) where people trying to put on size were actively NOT doing any cardio/fitness beyond weight training, and strictly avoided it out of fear of muscle loss from it. I mean things like running/jogging, plyometrics, sports, etc. Some said how "out of shape" it made them. I foolishly believed this to be true, and now I feel incredibly out of shape as well. I basically cut down things like running until I eventually just did weight training, and I feel out of breath now on the first set. Back when I did loads of cardio I never felt out of breath and still felt strong/etc., but feared that all of the sports/cardio I was doing would be halting the progress of muscle gains. So what's the conclusion here? Can most people generally be highly fit and put on+maintain muscle? I mean "highly fit" like being able to run a 5K and still bench three plates while looking built. A lot of those "big guys" tend to have loads of power, but look like they're out of breath after 10 reps at 50%. I don't want to be built and muscular if I'm going to be an out of shape lardass -- I want both worlds. Now I'm trying to get back in good shape again, but struggling to find the right balance. I used to easily run at least one mile a day, every single day -- and do 50-100 box jumps a day with no problems. How can I know the fine line between "too fit and a risk for effectively building muscle" and "building muscle, but still can run and not get tired easily?" I've read conflicting studies, reports, anecdotes, and etc. I'm lost and don't know how hard I should push to be fit while keeping certain that I'm not "sapping" muscle away. My diet is fine, and I certainly know that more active means more food needs. Am I worrying for nothing or what should I/others need to take note of in these endeavors? Note that I don't only do cardio/steady-state stuff, but also plyometrics/jumping, springing/HIIT, bodyweight exercises, sports, cycling/bike riding and other explosive, heart-tapping exercises. Here's an article from Greg Knuckols entitled "Avoiding Cardio Could Be Holding You Back" and another from Juggernaut Training entitled "Conditioning: How To Do It Right"
The better you get at weights, the more weights you have to lift. The heavier the weights gets, the more energy it requires to lift them. The more energy you need to expend, the better conditioning you need to be in order to expend it. Good conditioning helps you not get exhausted as easily which helps with recovery between sets. Cardio conditioning has also shown to help recovery between workouts. The kind of cardio that the Knuckols article recommends is steady state cardio on a bike for up to two hours a week. Where-as the Juggernaut article recommends more explosive, polymetrics style cardio three to four times a week for about 20 minutes. The point is, cardio is not a "gains killer" that some people seem to think it is. If you want more real-world examples, look at Rugby players and American Football players. 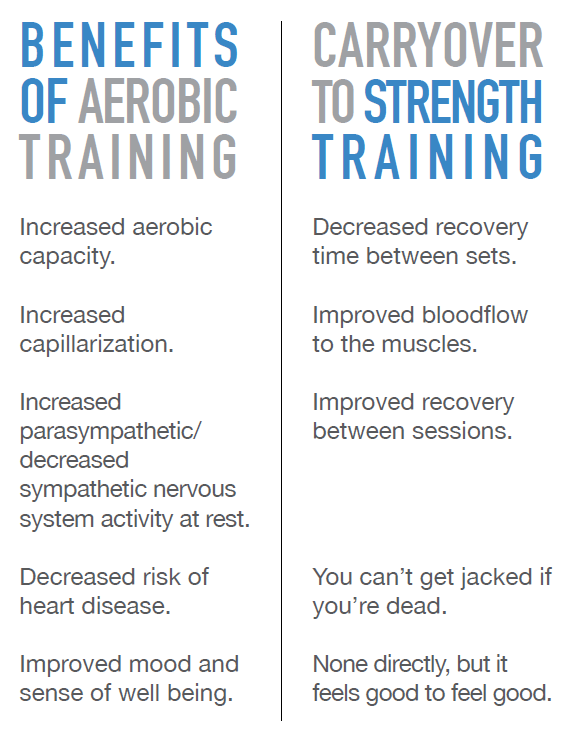 Two types of athletes that tend to be incredibly strong and well conditioned. Some arguments point to long-distance runners/marathon runners as an example, which are not known to be the most muscular people, but are usually developed well and are quite lean. People always point to these extreme examples. Basically, you don't see large marathon runners because marathon runners spend most of their time marathon running. Endurance sports take a lot of energy and time. If you spend too much time doing one thing, it's going to take away from the other. Not to mention, it is to their benefit to be as light as possible as each extra pound has to be carried for miles. Finally, endurance sports promote type 1 endurance muscle fibers where-as strength sports promote type 2 fast-twitch muscle fibers. Sprinters and track-athletes tend to be much more muscular because of that. Do I have to push myself to the limit to burn enough calories? best way to build cardio endurance? Can fitness be “regained” like muscle can with muscle memory? Is it possible to gain muscle while being on a calorie deficit?